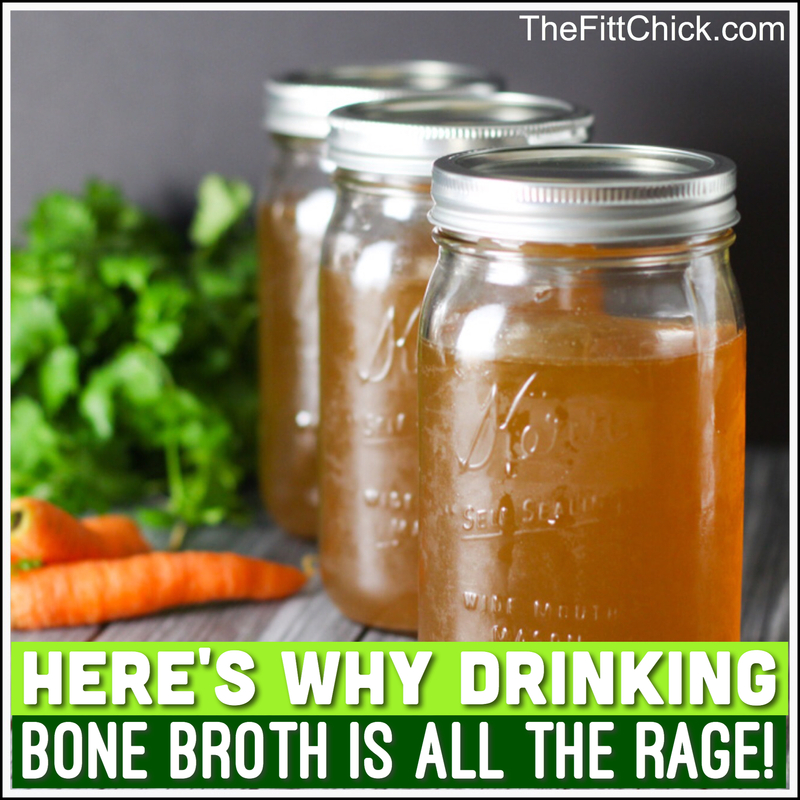 Why Everyone Should be Drinking Bone Broth! Bone Broth is one of the biggest food trends of 2017, but so many of my clients and followers are asking why they should add it to their daily diet. This nutrient-rich soup is truly a restorative miracle potion and celebrities and athletes are sipping and singing its praises for a reason. Besides tasting great, bone broth boosts fitness performance, joint function, and the immune system. Some say you’ll look younger and sleep better! 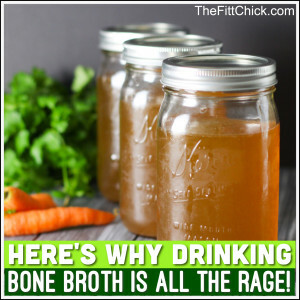 Homemade bone broth is chock full of nutrients missing from our modern diet. It may sound like a strange name, but bone broth is simply boiling bones for a very long time with water, fresh lemon juice, and apple cider vinegar to create a pot of nutrition packed liquid. Bone broth is actually the oldest fad ever! Our grandmothers had it all figured out! If you have a cold or felt sick they made soup. It was the immune booster when medicine wasn’t as advanced as it is today. They were using food as medicine, WHICH WE ALL SHOULD DO! I make my own Bone Broth as simple as possible, with as few ingredients as possible. I usually keep my crock pot going for a few weeks and keep adding water and more bones until I want to start with a fresh batch. If you are low on time, I love Kettle & Fire as quick replacement for a warm soup on a cold day! – 2-3 pounds oxtail or any bones you can find like chicken feet or marrow bones. Peel carrot, celery, and parsnip. Halve the onion and peel and halve the garlic cloves. Place everything into the crock pot along with your bones. You can really use any bones you like! Chicken, pork, or beef with or without the meat. I use Oxtail because it is rich in gelatin and contains healthy fats. Add water until the bones are covered, and add apple cider vinegar, lemon juice, bay leaves, and sea salt. Make sure to not skip the vinegar or lemon juice because it will release more minerals into the broth. Cook with the lid on low for at least 48 hours, and add water if anything evaporates. Eat a cup everyday for the best benefits! If you want to take out all the pieces and save the broth in your fridge, that works also. I personally like to keep it going daily and keep adding more bones, water, apple cider vinegar, and salt. 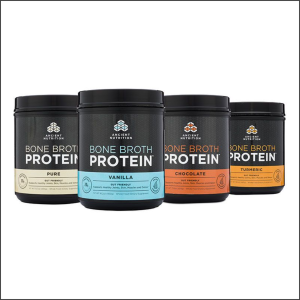 If making bone broth seems like too much work, Dr. Axe (who everyone should follow) has created a bone broth protein powder that tastes amazing and contains 20 grams of protein per serving. This breakthrough supplement delivers the benefits of homemade bone broth in a convenient easy-to-mix form. I use the chocolate or vanilla protein powder to make protein shakes for my family, and I love the Turmeric flavor as a warm cup of soup in the afternoon. There is definitely a flavor for everyone, and they even come in individual packets to try which one you like best! Bone broth may be the “hottest trend in health” today, even though it is centuries old. I cannot stress enough how every person should be drinking bone broth EVERY SINGLE DAY! Who doesn’t want a food that is rich in protein, collagen, gelatin, and key minerals often missing from your diet? In one cup of soup or easy to make shake you can help heal you gut, strengthen your immune system, boost your metabolism, help with joint and muscle health, keep you hair, skin, and nails healthy (my nails have never grown so fast), and just keep your body in overall good health. If you want to take your healthy diet to the next level, this is one product I can’t say enough good things about! I have been drinking bone broth for over 2 1/2 years and can see a huge difference in my hair and nails, as well as how I recover from workouts. I also love the extra collagen in my diet. My skin has never looked better! I can also see that my symptoms of leaky gut have slowly gotten better, and some of my food intolerances are gone! I even have 70 year old clients who say they feel so much better, and teenage clients who say their skin is better then ever! If you are looking for something new to add to your diet, BONE BROTH IS IT! Whether you choose to make your own or buy it ready-made, START TODAY! You will be so glad you did! It is the best thing I have added to my diet in years, and I feel so great giving it to my children. This is one Superfood that is perfect for anyone at any age! A Post Baby Transformation You Have to See! 8 Drinks That Help You Lose Weight!